With so many cellars at the site, it really has atmosphere, doesn't it? The company was founded in 1679. 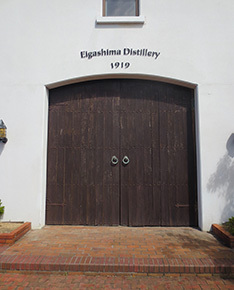 Then, in 1888, five brewers in the area agreed to merge, forming Eigashima Brewing Co., Ltd.
At the time, it was a groundbreaking step to form a public company, and it is believed to have been a first for Hyogo Prefecture. On the site, there are seven cellars, of which five were established in the Meiji era (1868-1912), while one was established in the Taisho era (1912-1926), and another in the Showa era (1926-1989), so that the majority of the cellars date back to the Meiji era. With so many cellars, it is remarkable that they are all in use. 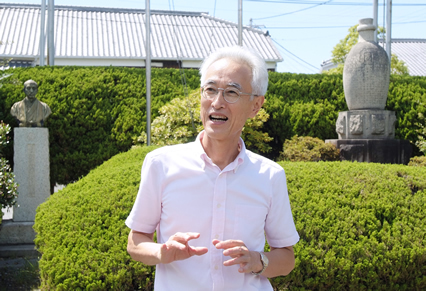 The company's founder, Heikichi Urabe, strongly believed in marketing the sake produced in Nishinada across the whole country, and following the merger, the company was able to grow to the point where, after just seven years, it was placed sixth in the country in terms of the quantity shipped. What sort of sake is Kamitaka, the company's representative brand of sake? throughout the country and has a large share in the Kanto region. Kamitaka made its debut as our representative brand in the early days of the company's development, in 1895. It is a dry, refreshing sake which became known nationwide after appearing in commercials in 1975 with the catchphrase "For sake, it's Kamitaka. Men like their sake dry." It was the first famous brand of sake to combine all the elements of excellent water, excellent rice, and highly skilled technique. Here at Eigashima, we are blessed with water that gushes from underground after having passed through the granite of the Rokko Mountains and layers of shells on the coast. It is said that using this water in the fermentation process produces the special, fine flavor known as "gokumi." Our highly skilled master brewers work with high-quality sake rice harvested from the Banshu Plain and our famed water source. I understand there used to be a bottling plant on the site, too. Sake brewing tools and resources are on display. 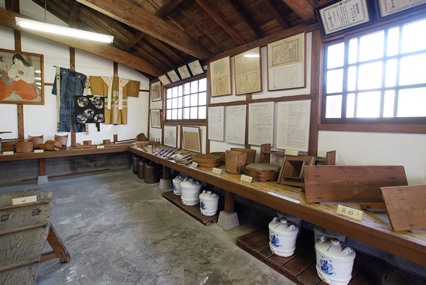 The eigashima and Japan's brewing industry's history can be studied here. Our founder, Heikichi Urabe, was passionate about brewing sake, and in 1899 began exporting it to Hawaii. At that time, sake was sold by volume, measured with sake bottles, and because of that, there were a lot of false sake bottles in use. So our company built a bottling plant and started selling sake packaged in 1.8 liter bottles. 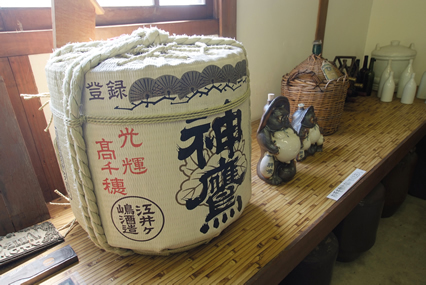 As well as preventing deception, it was an excellent way of preserving the quality of the sake, so it spread throughout the industry in the blink of an eye, and indeed it can be said to have become a symbol of the sake industry. As well as sake, I understand you also produce whiskey, wine, and shochu. has a modern feeling to it. Japanese whiskey has become quite popular. In line with the ideas of our founder, construction of a distillery was completed in 1919. Subsequently, we began producing shochu, mirin, whiskey, brandy, and wine, expanding to become a producer of a comprehensive range of alcoholic beverages. With our involvement in the production of whiskey, wine, and brandy, you could say we have been part of the history of foreign liquors in Japan. In 1963, we established a winery in Yamanashi Prefecture, and produced wine with grapes harvested from our own vineyard. In 1981, we established a shochu distillery in Oita Prefecture, and began selling our "Fukuju Tensen" brand of shochu, distilled from barley. It's our goal to continue as a maker of a comprehensive range of alcoholic beverages, making delicious drinks available at reasonable prices for all to enjoy.